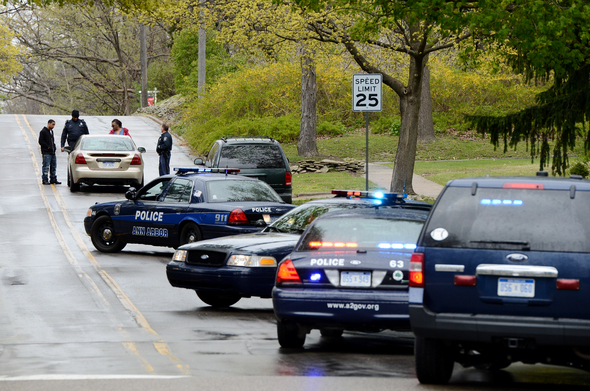 Posted on Tue, Apr 10, 2012 : 3:40 p.m.
Ann Arbor police officers investigate a pedestrian-vehicle traffic accident Tuesday afternoon that sent a middle school age girl to the hospital. A middle school-age girl who was walking in the 800 block of Newport Road near Miller in Ann Arbor was struck by a car Tuesday afternoon. Ann Arbor police responded to the scene at about 3:10 p.m.
Officers said the girl was conscious and alert when they arrived. The girl - whose age was not immediately available - was taken to an area hospital by Huron Valley Ambulance. Officers remained on the scene after the crash as they conducted their investigation. Ann Arbor police Lt. Angella Abrams said it was unknown what school the girl attended, but Forsythe Middle School is near the location of the accident. Thu, Apr 12, 2012 : 6:55 a.m. Wed, Apr 11, 2012 : 3:24 p.m. Personally, I think Ann Arbor needs to take a long hard look at sidewalks in areas that were built out as township and then absorbed into the city. (I suspect that's the case here.) If you look at the older neighborhoods (e.g. Old West Side), you've got curbs, sidewalks, crosswalks, etc. If you look at the incorporated neighborhoods, you've got what look like country roads with missing or scattered sidewalks and no curbs. The latter environment is just not safe for pedestrians in general or children in specific. I would like the city to develop a multi-year street by street plan to get us to a point where pedestrians (including children on their way to and from school) can walk safely anywhere in the city. Wed, Apr 11, 2012 : 5:13 p.m. It's not quite that simple... Sidewalks are not necessarily the best solution, nor are they the only possible solution. Better enforcement of the school zones, speed limits and placing speed bumps near the schools are other things to consider. Wed, Apr 11, 2012 : 2:51 p.m. Lets see, the girl should not have (allegedly) crossed the road where there was no crosswalk. All children are taught that when very small. The person who (allegedly) hit her should have been driving more carefully in order to avoid hitting something in their path of travel. The city should consider erecting a traffic light at that intersection. Drivers should slow down and eliminate in-car distractions. It is the first accident that I have heard of occurring there in 65 years, though there could have been others I suppose. It was an accident that should not have happened. Pretty much sums it up for me. Wed, Apr 11, 2012 : 2:50 p.m. This article has 117 words. I would love to know the article to comment word count ratio here and how it stands with the all-time &quot;greats&quot;. Idle speculation and blanket accusations are certainly grist for the mill, aren't they? Wed, Apr 11, 2012 : 2:33 p.m.
Children living in this area are too close to school to warrant school bus transportation and need adequate sidewalks and stop lights to make walking to school reasonably safe. These are preteens and younger walking to and from school in the process of learning safe decision making. Drivers, walkers and bikers all need to cultivate greater awareness of one another. Wed, Apr 11, 2012 : 1:56 p.m. I am a parent of two kids who attend Forsythe Middle School. I drive on that Miller-Newport intersection at least four times per day and it is extremely dangerous for kids to cross. I always stop for kids crossing, but even that is tricky. Cars behind me often can't even wait or don't pay attention and continue to drive and pass me on the right. I have to stop towards the right side to prevent cars from passing me while kids cross the street. A stoplight is definitely needed on that intersection!!! Wed, Apr 11, 2012 : 1:41 p.m.
AnnArbor.com, an update on the little girl's condition would be much appreciated! Wed, Apr 11, 2012 : 2:43 p.m.
David, An update is waiting to be edited right now. Should be up soon. Wed, Apr 11, 2012 : 1:26 p.m. I live on Newport Rd. just past M-14 and I drive on it everyday. Except when I need extra speed to get up an icy hill I always go the speed limit which is 25 mph all the way until you get past Rudolph Steiner (or whatever it's called these days). Almost everyday I have very agressive, very pissed off drivers tailgating me and glaring at me after I turn because I go the speed limit on the street with 2 schools and where many children (including my 2 girls) live and walk. I have even been passed on this road for going the speed limit many times and more than once the person who passed me has turned into one of the schools. I'm not trying to blam the driver or the pedestrian for what happened here because as many have already pointed out there is no information about what happened here but I do know that there are many drivers that drive way too fast and are angry about not being able to drive even faster. There is a crosswalk up by the school. It is well marked with a blinking yellow light above it so drivers can see that it is there long before they get to it. I don't think that more crosswalks on Newport would make drivers or pedestrians any safer. As other people have said what needs to happen to make everybody safer is for drivers and pedestrians to pay attention to what other people are doing and think about how they are going to interact with the other people traveling around them. Wed, Apr 11, 2012 : 2:45 p.m.
&quot;there is no information about what happened here&quot;... so true. Thus all the speculation. Can we actually call it a news story? AA.com, please bring your level of reporting up to something beyond headlines. Wed, Apr 11, 2012 : 1:27 p.m. Wed, Apr 11, 2012 : 12:41 p.m.
She was crossing from left to right in the photo above, not because the sidewalk ended, walking home from school, not toward the school. And yet AGAIN, as I was traveling Miller TODAY toward downtown Ann Arbor, the FOUR cars in front of me FAILED to stop on Miller at the crosswalk which had two girls, one mother and two white fluffy dogs- very visible and waioting to cross- yet the FOUR drivers in front of me blew right past- AS USUAL!!! I stopped, and finally the oncoming traffic stopped. The problem is that people think where they are going at 7:40 a.m. is more important than anyone else. Wed, Apr 11, 2012 : 4:01 p.m.
Just because it happened at the end of the school day, you can't make the assumption that she was walking home from Forsythe. Perhaps she attends A2 Open, right down the street, and she was walking home and up Newport? Unless you have additional information or were at the scene or something along those lines. Wed, Apr 11, 2012 : 12:26 p.m. Typical Ann Arbor response - placing blame all over the place before they know what actually happened. Let's just hope the little girl is okay and the driver can get over the trauma. .....and annarbor.com, where is the update? In such a small town where something like this happens so rarely you should be able to find out something more by now. Wed, Apr 11, 2012 : 11:12 a.m.
Where have the schools been with information? When the Skyline student was hit, they were quick with an email. Its bad enough that AnnArbor.com is so vague, but why is the school system so quiet this time? I also grew up in this area. There is no excuse for the city to not have done something a long long time ago. The newer subdivisions add additional traffic that was not there in the 70's and 80's, and no changes occurred to handle the traffic. Recently, I sat waiting to turn right onto Miller, while a bus waited to turn onto Newport for at least 10 minutes. There was a terrified young boy trying to decide if he should play a life size game of frogger because westbound Miller would not stop for him to cross. Its amazing something like this didn't happen sooner. It shouldn't have happened at all. Wed, Apr 11, 2012 : 2:39 p.m. Yes, the AATA buses tend to sit at the stop there on Miller (at least in the mornings), I guess to catch up on their route timing. But that completely blocks the sight of traffic coming down Miller from anyone trying to pull out from Newport. This is dangerous because it forces drivers to pull out &quot;blind&quot; to oncoming traffic. THAT is something that the city (or AATA) should definitely address. Wed, Apr 11, 2012 : 1:31 p.m.
An email was sent from Forsythe at 8 a.m. which said in part &quot;There was an unfortunate accident yesterday after school when one of our students was hit by a car as she was crossing Newport Rd. near Miller Rd.&quot; The intersection is a mess, both the driver and student were navigating it as best they could. The fault lays with the lack of priority to fix the intersection. Lines of sight, left turns, city bus stops, crosswalks, and cars parked on the northbound lane of Newport need to be addressed. Heck, I've almost gotten hit by other cars coming out of Newport and I was in a big bright color car. I thought for sure I was going to get hit by the school bus trying to turn left this morning. Neither of us could see with the city bus stopped at the corner. Adding pedestrians with no traffic control when drivers can barely even see each other is asking for more accidents. Wed, Apr 11, 2012 : 10:56 a.m.
Thu, Apr 12, 2012 : 12:24 a.m. The speed bumps I've seen are all on LEVEL roads, like Rosewood, Yost and Iroquois. Wed, Apr 11, 2012 : 10:30 a.m.
How about a simple old-fashioned stop light at the corner of Miller and Newport? Congestion there, especially at school arrival and departure times, often leads to impatient drivers and questionable safety for people standing at the corners. My sixth grader walks home from school along this route. I don't know what took place to create this terrible accident, thanks to no updates from Ann Arbor.com for the past 16 hours since it happened. But a traffic light at the corner would go a long way toward making things safer at that corner for walkers and bikers. Wed, Apr 11, 2012 : 12:53 p.m.
maybe teach your son to stop at the corner and raise his arm to show drivers intent of crossing and then cross when they have stopped. I know it seems you shouldn't have to, but it is safer. When I was a crossing safety guard in elementary school we had to wear those orange belts and raise our arm until cars stopped then we could let the little kids cross. More people will see someone with an arm up and wonder why and then realize they should stop. I raise my hand at a number of intersections when I want to cross, rather looking silly with my arm in the air then smushed all over the road (or waiting at a corner for 10 mins). Wed, Apr 11, 2012 : 12:20 p.m. But the accident didn't happen at the intersection. How is a light going to help when someone is crossing mid-road. Wed, Apr 11, 2012 : 4:24 a.m.
it doesn't matter that the sidewalk ends, just because it does doesn't mean that is where you cross the road. You cross the road at the safer spot, which in this case would be at the intersection of Miller and Newport. Also, further up on the side we can see the reason why there is no sidewalk is because there is a huge slope in the land (wooded area). There isn't enough of a level area to have a sidewalk. You'd fall into a wooded abyss especially if it were icy. I agree that Newport offers roadway for speeding, perhaps some speed bumps closer to the school. Part of the problem is the big hill turning from Miller you have to accelerate to climb the hill. Many just keep the foot down on the gas longer than they need and they wind up speeding, the opposite effect happens coming down Newport, you end up coasting at a higher speed then the limit and you are then speeding unintentionally. Growing up there were always two speed traps on Newport. One at Bird Hills and one further down near Newport School. Thu, Apr 12, 2012 : 12:21 a.m.
Only now it's a Rudolph Steiner school. I think that building has been used as a Rudolph Steiner School longer that it was Newport Elementary School. Warrington residents turning left from Newport, if I remember correctly, are crossing over a lane where northbound motorists think they can coast. Wed, Apr 11, 2012 : 3:26 a.m. I see people texting while driving all over town. My favorite was a women on a 50mph road driving 40mph while she looked down, weaving a little, clacking away as the cars stacked up behind her. This trend is going to continue for years as foolish drivers learn the hard way, one ruined life at a time. Wed, Apr 11, 2012 : 3:08 a.m. There are actually sidewalks on both sides of Newport here. So the problem is not the lack of sidewalks. Wed, Apr 11, 2012 : 3:47 a.m. Wed, Apr 11, 2012 : 2:19 a.m. Isn't there a roundabout planned for the intersection of Miller and Newport? That should help safety for everyone, I'd imagine, as would sidewalks. Thu, Apr 12, 2012 : 12:15 a.m.
Not enough room, you say. I thought it: the Methodist Church on Miller, right there at the intersection, would lose some land, if not part of their building, if a roundabout went in. Wed, Apr 11, 2012 : 3:44 a.m.
Roundabout is off. Not enough room to fit it apparently. Wed, Apr 11, 2012 : 1:48 a.m.
What a tragedy Important points that have already been said: 1. Why does the city allow the sidewalk to end without a proper cross walk? Why is there no sidewalk? Last I checked we wanted sidewalks in the city to allow safe walking yet for the next dozen plus houses there is none? 2. While I cannot comment on this driver, many go far too fast on roads all over town as Ann Arbor police enforcement of speeds has virtually disappeared. The standard speed on Liberty is 10 over, on Maple from Jackson to M-14 15 over, on Miller and Dexter 5-10 over... but I haven't seen a police car in months. 3. Just up from this area the sidewalk is directly next to the road offering no pedestrian protection. 4. I agree the cross walk at Miller and Newport is dangerous AT BEST! The cars only focus on the Miller traffic (as it is flowing too fast and constant) so trying to cross is taking your life in your hands. Is it going to take a death for A. Police to step up enforcement B. The reduction of some speed limits? Wed, Apr 11, 2012 : 1:51 p.m.
You can thank King John and City Council for the lack of police coverage. Wed, Apr 11, 2012 : 2 a.m.
Police? Enforcement??? Honey, we ain't got no po-po's no more! Wed, Apr 11, 2012 : 1:36 a.m. I love how everyone is quick to blame the driver here. It looks to me judging from where the car is stopped on the roadway that the gal stepped off the curb because the sidewalk ran out. Perhaps she was distracted somehow but the car is clearly in the middle of the road as it should be. With all the hullabaloo about pedestrian safety, this area seems an oversight. Where are the pedestrians supposed to go when the walk runs out, and thats 200 feet off the intersection uphill where people are accelerating. What give ann arbor ? Thu, Apr 12, 2012 : 12:11 a.m.
&quot;Perhaps she was distracted somehow...&quot; I don't know if she was wearing an ipod, shutting out sounds all around her, but that is how one boy in the Kalamazoo area got hit by a train after he got off his school bus and walked along a railroad line toward home; he didn't hear the train coming because he had tuned out all other noise with his ipod. If an ipod can drown out a train whistle, it can drown out the approach of a car. Wed, Apr 11, 2012 : 11:32 a.m. Wed, Apr 11, 2012 : 1:22 a.m. I live on that block and even though that hill is a bad block for pedestrians, the real issue is that cars go WAY too fast. I have almost been hit tons of times walking across the street to get the mail because people come over the hill or around the corner from Miller going 30, 40, 45 mph. I hope that this will encourage the police to patrol this area for speeders more. Sat, Apr 14, 2012 : 5:19 a.m.
@Tesla: Given that you appear to agree that the sidewalks and roads and perhaps even the sight lines are inadequate, there can really be no excuse for speeding. Self-entitlement is no excuse. Wed, Apr 11, 2012 : 11:26 p.m. Speeding is an infraction actually, not a crime necessarily but thats not even the point. There is no evidence that this driver was speeding or did anything wrong at all. It appears to me given the placement of the vehicle that this was a true accident and that the pedestrian in this case bears some responsibility. Instead of whining about speeders you should whine to the city council to fix your sidewalks and repave your crumbling roadway. Wed, Apr 11, 2012 : 2:05 p.m. Wed, Apr 11, 2012 : 1:32 a.m. They patrol the area plenty. They like to sit on Westport at the bottom of the hill and they maintain your neighborhood just fine given they are under staffed and hopefully crime is a priority. Tue, Apr 10, 2012 : 11:36 p.m. I moved here a few years ago from down South, live in 7th Street, and continue to be amazed at the carelessness and aggressiveness displayed by drivers here. A2 drivers: take a chill pill! If you are that late...you should have left a half hour earlier...your arrival time is not more important than someone's life! Prayer for the little girl!!! Tue, Apr 10, 2012 : 11:14 p.m. I travel down Miller and Newport several times a day, and my child attends Forsythe with the victim. Anyone can see how many people blow through the crosswalks when children are waiting in the morning, and after school. EVERY DAY. Which is, of course, no only unsafe, but ILLEGAL. BOTH the crosswalk on Miller and the crosswalk on Newport are hazardous. The beige car that hit her obviously turned off Miller onto Newport- LOOK at the photo! SLOW down people! Especially when it's during the time that many children are traveling to and from school. There is no place you are going that is more important than a childs life. Either a crossing guard or something else is needed- NOW- before it's too late. Wed, Apr 11, 2012 : 2:03 a.m.
Tesla I certainly was not blaming this driver. It appears the student was not at a crossing. I was pointing out that the vast majority of drivers on Miller at Newport and the Newport crossing near Forsythe do not stop when there are kids waiting. Wed, Apr 11, 2012 : 1:38 a.m. Lets wait for the police report before blaming the driver here. Wed, Apr 11, 2012 : 12:32 a.m. I must say there are very few cars that stop for kids trying to cross Miller at Newport. And at the crossing on Newport just before Forsythe. Pay attention people. Take the time to stop at these crosswalks! Tue, Apr 10, 2012 : 10:08 p.m. I can't count how many times while driving on country roads I come over the crest of a hill and two pedestrians are walking two abreast up the hill toward me on the other side. It is a scary situation. Similar to what may have happened here I would think. Tue, Apr 10, 2012 : 9:47 p.m. I am surprised to read that area residence want proper crosswalks, as someone who went to Forsythe and then worked as a nanny in the neighborhood every summer in highschool and for a number of years beyond I walked quite a bit up and down Newport often pushing a double stroller while walking a dog or two. It is not impossible or unsafe to cross the street at the stop signs. Even the picture shows the wide band marking where there is a stop sign, yet the car that struck the girl is approx 7 car lengths from that. So did the girl cross at the stop sign and was dragger or did she cut across rather than walk (all the way) to the stop sign? and why not at the stop sign where it would be safer to cross? One thing about Newport is you don't cross too close to one of the hills where it will be more difficult for a driver to see you. At any rate I hope she is ok. and gee, did ALL of the patrol officers respond? I haven't seen so many patrol cars in Ann Arbor at one time! Wed, Apr 11, 2012 : 12:48 p.m.
@Craig, I should have had the word lately in there regarding the cop cars. You said it yourself, &quot;years ago I saw&quot;. Yes that was years ago. For the past couple years though I could go months without seeing a patrol car unless it is parked on Ann St next to the Police Garage door (those don't count). Wed, Apr 11, 2012 : 11:53 a.m.
Several years ago my daughter and I saw 7 police cars on Huron Parkway between Washtenaw and the Golf course running a radar speed trap. One guy standing on the sidewalk with the radar gun and 7 patrol cars lined up like cabs outside a casino. Tue, Apr 10, 2012 : 10:47 p.m.
Sure does look like the whole AAPD afternoon shift..
Tue, Apr 10, 2012 : 9:41 p.m. I am so tired of the lack of reporting done on the part of AA.com. It seems every pseudo-article I read is highlights from a police radio. Where is the reporting?!? An update on this story is waiting to be edited at the moment. Police would not give more information on the accident last night. Now 19 hours later...and yet no update. Why not? Wed, Apr 11, 2012 : 1:57 a.m. Reporting?? Hahahahahahahahaha! For the 46 years I've lived here, the amount of reporting done by this publication has been in decline. Articles delving into local problems have always been written from the point of view of those Newhouse News caters to. They went downhill until they had practically no reporters, and then, oops!, no paper. They tried to reinvent themselves online and refused to listen to those who could have helped. In fact, they fired all their knowledgeable people about a year ago. There's no one running the shop, so all they can publish is slop. Try The Chronicle. Tue, Apr 10, 2012 : 11:26 p.m.
Amen. It's now 7:26. We know no more than this after 4 hours? Tue, Apr 10, 2012 : 9:31 p.m. I run along Newport and right were the accident happened, I see many fellow runners and pedestrians trying to cross from the west side sidewalk to the east side of Newport because that's where the sidewalk resumes. This is a real tragedy. I hope she is okay. Tue, Apr 10, 2012 : 9:10 p.m.
That distinctive pine tree branch near the sidewalk gives away just where on Newport Road this accident took place; a distinctive tree in the front yard of a home well back from the road. I had no idea that residents had been trying to get proper crossing areas for children walking to and from school, but the photo above shows the risk of anyone crossing Newport Road on one side of that crest. Road crests are risky areas for motorcyclists and motorists turning left at them and for oncoming traffic; whoever turns left or is crossing the street on foot suddenly appears in front of those going straight. Tue, Apr 10, 2012 : 8:36 p.m.
Heartbreaking story! Please everyone, let's be careful on the roads. It is horrible to have this happening in a &quot;civilized&quot; society. Blessings to the little one and may she heal completely and quickly. Wed, Apr 11, 2012 : 3:50 p.m.
What relevance is &quot;civilized&quot; to this story?? Are you in insinuating that the driver purposefully hit the girl? Tue, Apr 10, 2012 : 8:11 p.m.
Tue, Apr 10, 2012 : 7:52 p.m. Isn't this the area where residents have been trying to get proper crossing areas for the children going to and from school? Is this what it takes for them to get it done? Hope she is ok. Wed, Apr 11, 2012 : 3:05 p.m. I believe the area under discussion was on Newport north of 14, not here. But, it certainly looks like there could be improvements for pedestrians in this area as well. There is not a soul that would advocate a crossing at this location! It is 100 ft or so to a stop sign. Hopefully the injuries are not serious and she will be back in school soon.